â€˜Tis the season to be jolly â€“ but not without fair warning! With one of the busiest and well-loved holidays around the corner, unfortunately, itâ€™s a time when criminals come out of the woodwork. Crowded malls, stressed shoppers, and occupied minds make some people easy targets. Thieves love the holiday season because people can let their guard down and become vulnerable to otherwise avoidable theft. Whether itâ€™s pick-pocketing, shoplifting, credit card fraud or other petty crimes, itâ€™s important to know how to minimize risk and protect yourself. The shopping season is in full swing, but buyer beware â€“ there are crooks everywhere! Stealing someoneâ€™s debit or credit card takes extra work. Thatâ€™s why cash is so attractive to thieves. If cash is all youâ€™ve got, keep it in a wallet and in your front pocket. You would think some people are having dinner at the royal familyâ€™s the way that they dress to go shopping. Dress comfortably and leave the jewelry at home. This will take a thiefâ€™s focus off of you. Try and choose one or the other â€“ cards or cash. Using ATMs can put you in a vulnerable position, not to mention the risk of card skimmers. 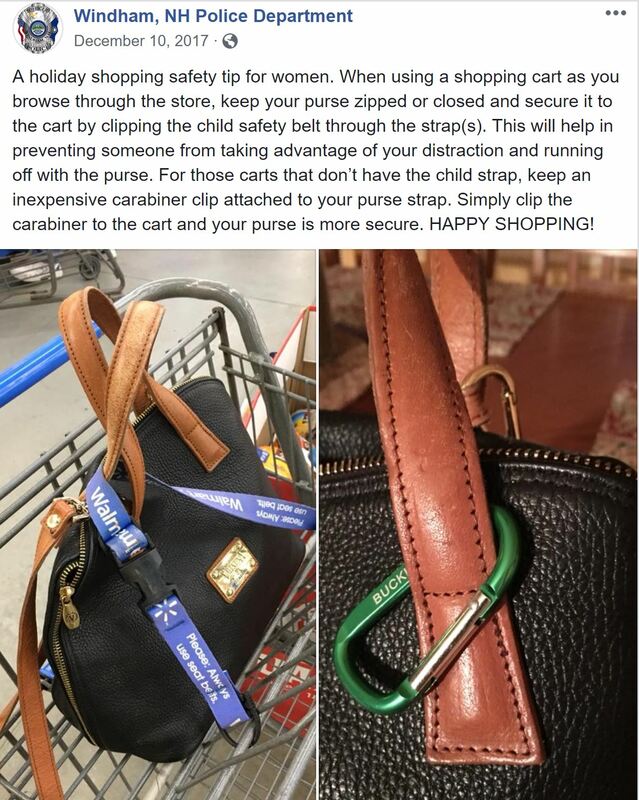 Not only is shopping with someone safer, but it makes the adventure much more enjoyable! If you must shop alone, try your best to do so during the day, or part in a well-lit area close to the mall entrance. Nowadays, everyoneâ€™s heads are down staring at their phones. Whatever the reason for head being down, lift it up! This will help you have better awareness of your surroundings and keep you safer. If your debit or credit card has gone missing, notify your bank before doing any more shopping. Given that itâ€™s the holiday season, chances are itâ€™s lost in your purse or winter jacket pocket. But, if itâ€™s a worst-case scenario, you want to minimize the damage as much as possible (if not completely). Leaving your purchases visible in any of the passenger seats can increase your risk of theft. To be safe, put as much of your purchases in the trunk. You can cover them with a sheet or blanket, too! That way criminals are less likely to entertain the thought of breaking into your car. While youâ€™re still in the mall, find and hold your keys before you leave. Looking down and fumbling through your purse makes you an easy and distracted target for someone trying to commit a crime with minimal resistance. Now that you know all the best holiday shopping safety tips, letâ€™s end on a lighter noteâ€¦ Hereâ€™s where you can find all the best Christmas movies, 24/7. The post Holiday Shopping Safety Tips: 10 Things Every Shopper Should Know appeared first on The Hearty Soul.